In fact, I over-ate so much that I actually struggled editing this post. 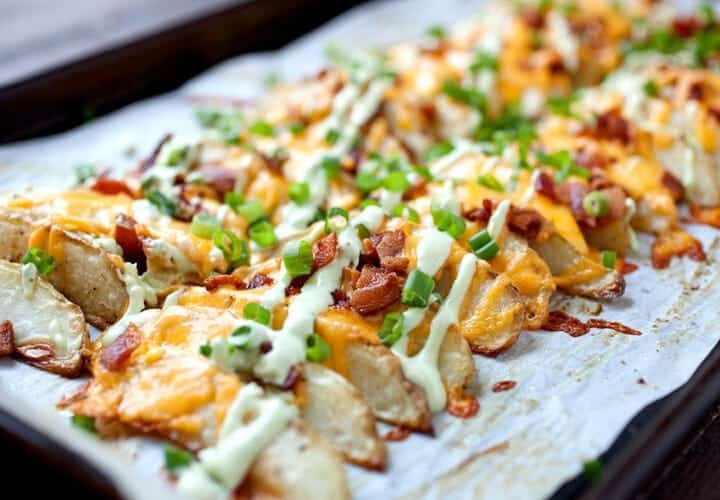 Don’t hold that against these loaded potato wedges though. It’s just that by the time I built up the strength to edit these photos, I was feeling more in the mood for a salad than potato wedges. But this post isn’t for me. It’s for people that maybe have some level of restraint. It’s also for people who realize that yet another holiday weekend of celebrating is this weekend and maybe you are out of appetizer ideas. 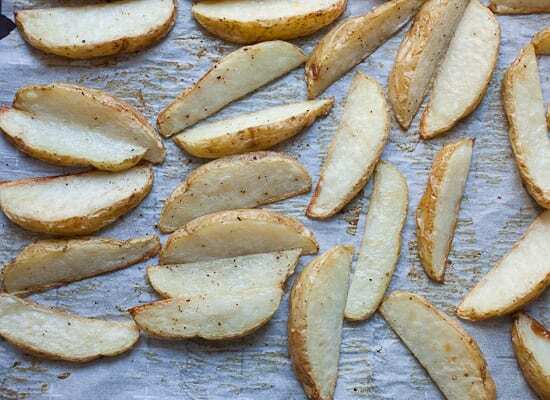 And while you could eat these wedges as a meal or side dish, they are really an appetizer. Having a few is delicious, but having half a sheet pan of them is a bit gluttonous. 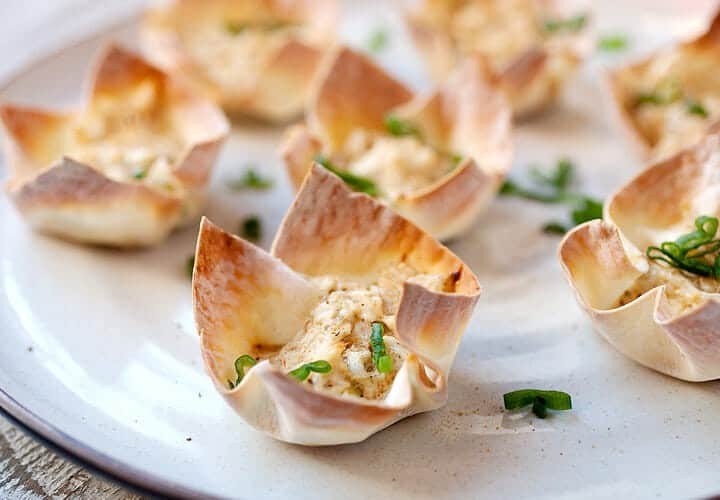 If you’re hosting a party or a game day this weekend, put these delicious things on the menu! You could use Russet potatoes for these, but I prefer the softer-skinned new potatoes. Get the larger ones though so you can still make decent wedges. These have less starch and I think they make for a better, crispier wedge. 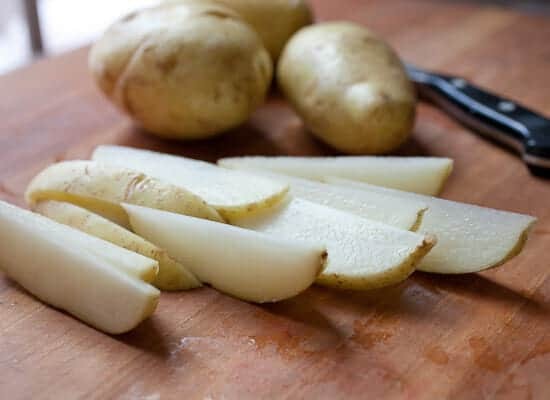 You should be able to get 10-12 wedges per potato. 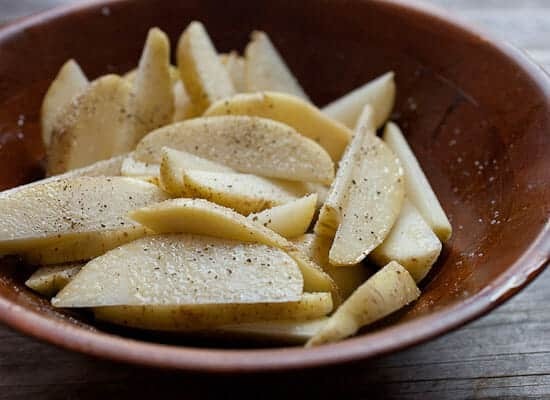 Toss the potatoes with some olive oil, garlic powder, salt, and pepper! Spread these out on a baking sheet lined with parchment paper. I think the parchment paper is really important. It’ll keep the taters from sticking to the sheet while they bake and also keep the whole thing from sticking when you add cheese later. 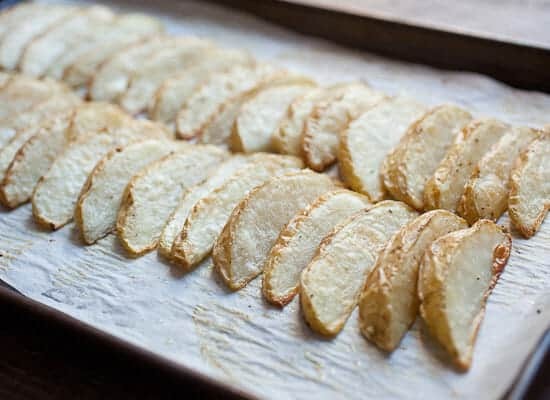 Also, try to make sure the potatoes aren’t over-lapping too much so they can crisp up. Bake these things at 400 degrees F. for 35-40 minutes and give them a flip halfway through. You could stop here and have really solid potato wedges. Assuming you want to take these to the next level though, re-arrange the taters so they are slightly overlapping. This makes it easier to top them. I call it the shingle method for obvious reasons. At some point, you’ll also want to get the sauce ready. I just pulsed a ripe avocado with some sour cream, lime juice, and a pinch of salt. If you don’t have a small food processor, you could just mash everything together really well. 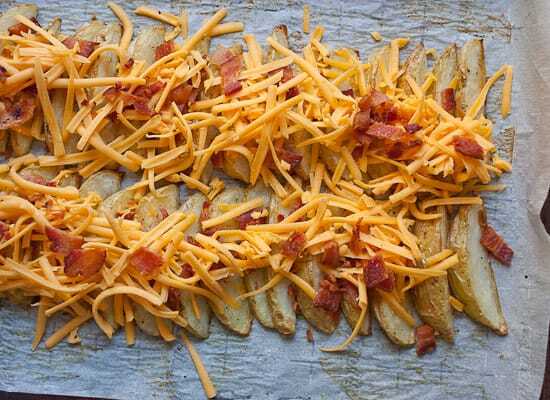 Add some grated cheese and crispy bacon to your shingled wedges! 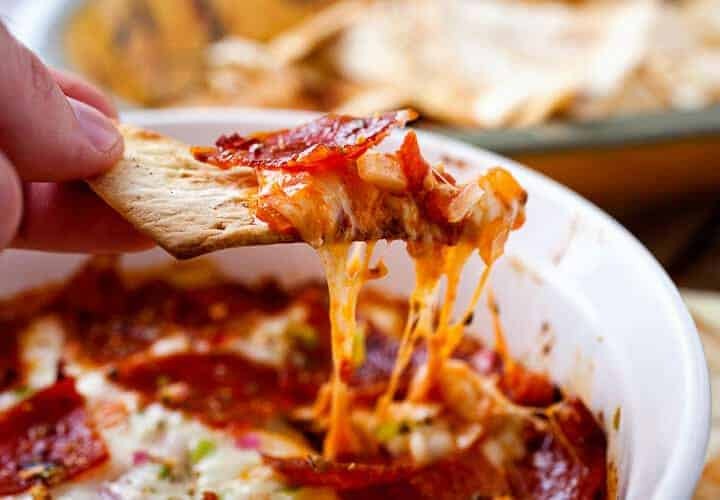 Return these to the oven for 5-6 minutes until the cheese is bubbling. This is what you’re looking for! Avocado sauce and some chives (or scallions) will finish off the wedges. Serve them while they are nice and hot! Okay… I lied about having trouble editing this post… now I’m hungry again! Holy mother, I want these for breakfast. Love this, Nick. You have taken this lowly potato to the next level, awesome! 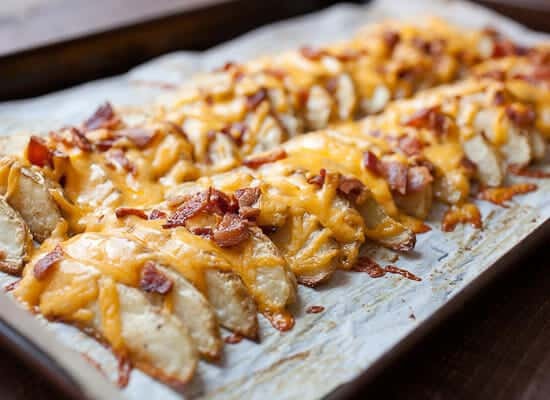 OMG — you just combined a few of my favorite ingredients — potatoes, avocado, cheese and bacon — together! I totally have to try your recipe!! :) You are awesome! You have a new fan here. Thanks so much….I was going to do twice-baked but these were better. We’ve done potatoes similar to these while camping. 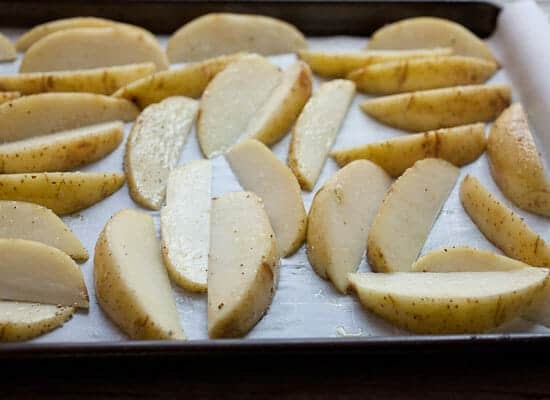 If you have a cast iron just put olive oil in the pan and keep stirring the potatoes until crispy and almost done. Once they reach that point add the cheese and bacon until melted then top with sauce and enjoy. Definitely will be trying this recipe Nick. Looks appetizing. Man I’m hungry already. 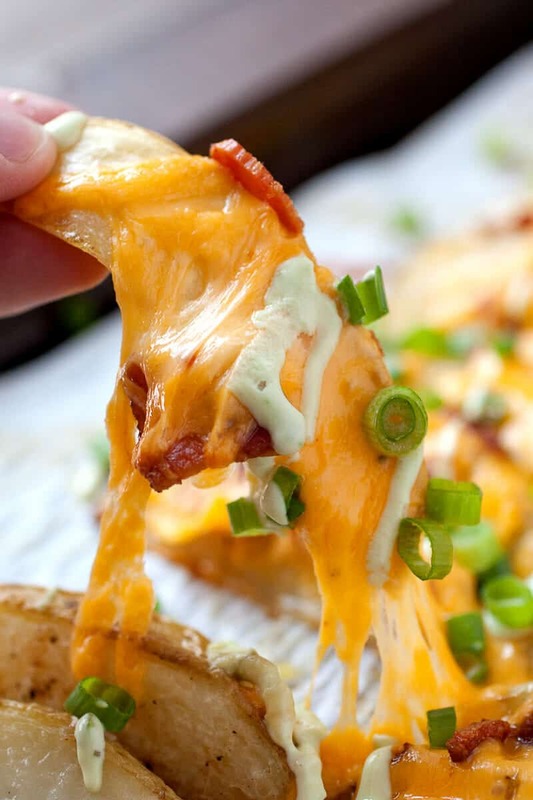 Omg can’t wait to maked these tomorrow night for my family,we r baked potato heads…. They r going to absolutely look your recipe. Thanks!!!!! Thank you for this recipe. My family loves them. I also make them for my coworkers. So delicious!!!! This is an awesome recipe! I made these with thawed hash brown potatoes instead. Fabulous, and no potato peeling! Just made little mounds with the potatoes and sprayed them so they crisped up around the cornersand were easier to portion and serve. You need a bit more oil when using hash browns, though, but no turning over is necessary. I also served the avocado and onions on the side, for the picker eaters to spoon on or not. Easier for me, better for them. Those potatoes look very interesting except the idea of using avacados I have never had avacados before not sure of the taste. 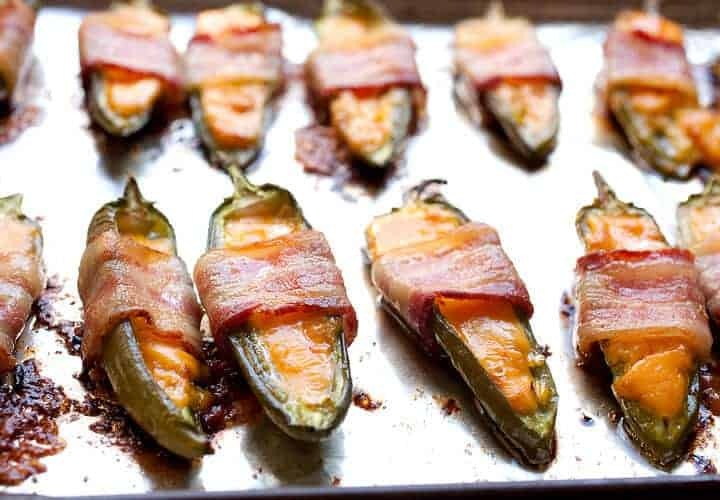 I would love to try them using say maybe a bacon ranch dressing. Ever tried that? Hey Sue, any dressing would be okay I think, but you should try the avocado one. It’s very delicious! These were way wonderful. I added chili (no beans) to mine. My husband loved them. They will be made again in my home. Thanks for sharing. These were way wonderful. I added chili (no beans) to mine. My husband loved them. They will be served again in my home. Thanks for sharing!! 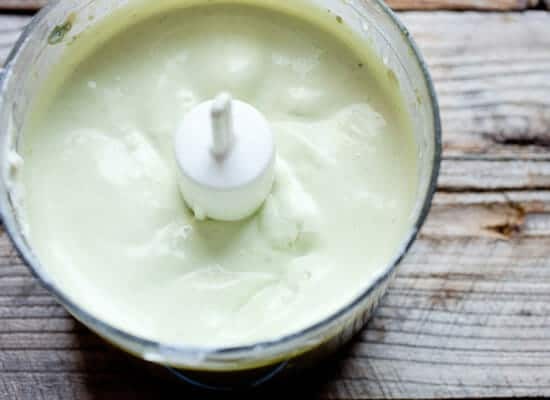 That avocado sauce looks amazing! If I make loaded fries of any kind, I almost always eat them as a main meal as opposed to a side dish. They’re too good to be just a side! :) It’s definitely the way to go! Loooove this recipe I just have one question how long does the sauce last? Thanks! It’s dairy based so I’d say a week or so in the fridge. After that it’s probably not worth it. Good luck!